After five years of construction, NTFGH and JCH were opened to the public seven months ago. Since they were launched, the hospitals have been recognised as amongst the most digitally advanced health care facilities in the region. The plan for the IT systems was put into motion while construction of the facilities commenced. JurongHealth aimed to provide a transformative healthcare experience through the integration of advanced ICT. As you approach the hospital, it may be surprising how visually striking it looks on the outside with its bold building design and landscape. However, this is all part of the plan to provide more improved and efficient healthcare to its patients. Recently, OpenGov had the chance to go on an exclusive tour of the hospital with Lim Soo Tong, CIO, JurongHealth. He introduced us to the greater mission of the hospital, the new facilities, the integrated EMR Suite, and all of the innovative ICT integrations. The opening of Ng Teng Fong General Hospital represented the digital transformation of healthcare as we know it. NTFGH is transforming the way that the hospital operates in a positive way by introducing Self-Service Kiosks, Pharmacy Automation System, Warehouse Management Systems, AGVs (automate guided vechicle) and extensive use of RTLS (Real Time Location System), to name a few. “With good integrated systems which enable the seamless flow of data, it really helps the hospital operate more effectively and efficiently,” said Soo Tong. At the point of entry, visitors and patients to the hospital are greeted by accessible self-service kiosks and counter services. Scheduled outpatient visits are provided with a system generated unique One Queue number for all service itineraries throughout the hospital via the Enterprise Queue Management System. This same queue number will be used during their entire same day visit. This has improved process efficiency through a pull and push concept, providing visibility of real-time queue status. At the Visitor Management System kiosks, visitors can scan their id cards or obtain e-pass which grants them access to the ward that they are visiting. While entering and leaving the ward, they must scan their id or the e-pass at the 2 in 1 Gantry which logs the visitor information in the system. The 2 in 1 Gantry tracks both staff and visitors who enters and leave the hospital wards. Collectively, these systems provide better management of patients and visitors to the hospital, while also making it easier for them to check in to the facilities. The way that stock supply chain is managed throughout the hospital is quite incredible. From the point that the hospital receives the replenishment through to the delivery and consumption, technology is there every step of the way. The Warehouse Management System (WMS) provides a quick and easy way for users to request a top-up of inventory. It uses a RFID drop-box, 2bin shelving system, and PDAs to scan barcodes. With the 2-bin shelving system, stock supplies are split between two bins and once the first is cleared out, the users will drop the designated RFID card into the reader which will automatically trigger the request for restock. This results in faster turnaround of stock replenishment and less errors. TheAutomated Guided Vehicles (AGV) represent another example of the innovative technologies which roam the halls of the hospital. They help in moving inventory to the stock rooms to delivering meals and medication to designated areas without the need for human intervention. Each of these systems reflect how ICT has transformed the hospital visit as we know it. The team at Ng Teng Fong General Hospital will continue to make the work flow more efficient and provide patients a better health care experience. Ng Teng Fong General Hospital prides itself on the integration of advance ICT solutions which help in deploying real-time information and services to its patients and staff. These solutions include the Real Time Location System (RTLS) and the Integrated EMR Suite. 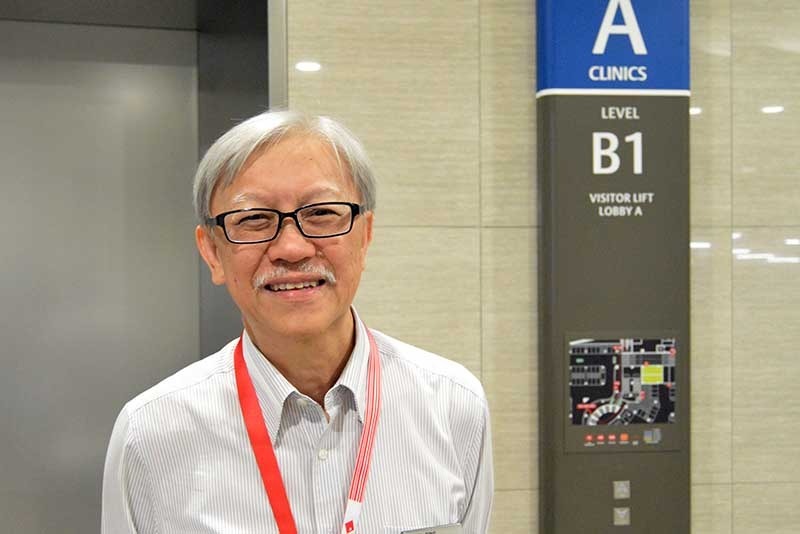 “The core of the hospital is really the hospital information systems,” Soo Tong stated. Using WiFi triangulation, low frequency exciters and active RFID tags, the RTLS works to track the location of all in patients and high value or critical assets. RFID tags are worn by patients and attached to physical assets. These tags will continuously communicate with the low frequency exciters and data will be transmitted to the backend system for processing. “In all, we have about 6,000 tags for the patients and the equipment. We will grow this pool in the future as we ramp up our activities,” Soo Tong told us. The ability to pin point the location of patient or an equipment comes in handy when healthcare staff need to know the whereabout of specific equipment in a critical situation, this eliminates the need for tedious manual searching. In addition to the RTLS, the hospital is the first in the region to deploy a fully integrated EMR Suite. An example of this system being used is demonstrated through the inpatient pharmacy automation system (IPAS). This system enhances medication safety and improves the medication dispensing and administration process through the use of packing machines, medication stations, and medication carts. Within the pharmacy store, machines packs and bar-codes medicine in unit doses. Then, with the prescription ordered by the doctor via the EMR system, the required medications are then packed into secured medication storage within the wards. At the bedside, the patient wrist tag must be scanned and matched against the order put in by the doctor before the medication cart drawer with the right medicine can be opened. This ensures that the right medication is being supplied to the ward and administered to the right patients. All of this information is integrated with the EMR suite, providing the feedback loop once the medication is dispensed and administered to the patient. This Integrated EMR System is a good model for other health care systems. It can help to improve patient care and the effectiveness of clinicians and nurses. “Another innovative use of technology is the integrating of the medical devices such as vital sign machines and dialysis machines with the backend EMR systems. The data streams from these medical devices are now fed directly into the EMR system without the need for human intervention,” said Soo Tong. What is next for JurongHealth? Soo Tong and his team are driven by greater objective of transforming healthcare in Singapore. Surprising enough, the outcome is shaped by the desire to keep the population healthy in the community and at home. JurongHealth wants to achieve this by partnering with other healthcare agencies such as Health Promotion Board and providers in the community such as nursing homes and GPs. It will also embark on telemedicine initiatives that will facilitate home care . In order to achieve this better healthcare in the hospitals, JurongHealth will continue to improve its systems through the continuous enhancements and introduction of innovative health ICT. JurongHealth is well on its way towards achieving HIMSS EMRAM Stage 7 by this year. This will put its hospitals on par with the best hospitals in the region that have been recognised with this benchmark. For more photos from our inside tour, please visit the OpenGov Asia Facebook Page!